This weekend is Frederick’s annual 72 Hour Film Fest, a timed competition in which participants have three days to make a film. Unlike Baltimore’s 48 Hour Festival, in which participants are given a line of dialogue, prop, genre, or location, 72 Fest tends to have much more unique criteria, such as adapting stories or basing films around pictures given to participants. Throughout the summer, the marketing committee behind 72 has been posting video clues online, hinting at what this year’s theme may be. In each video, a children’s toy block with a letter could be seen. The implications for this year’s criteria could be incredibly diverse given this choice. For example, literary critics claim that science fiction originated with Mary Shelley’s Frankenstein, which also featured elements of horror, tragedy, and fantasy. “Science,” as a theme could lead judges to restrict the genre criteria to one of these choices. 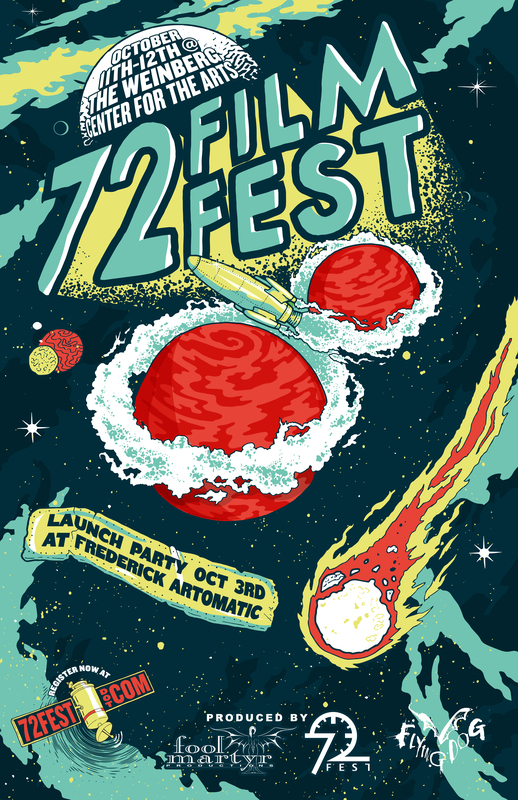 I’ve participated in three previous 72 Fest’s and have always enjoyed the experience. I rarely get the opportunity to work with a group of friends for such an intensive, filmmaking weekend, so each year we collectively set aside time to participate. It really influences my schedule as well, because it requires that I get all of my homework done ahead of time, knowing that NO free time will be allowed once production starts. Official poster for this year’s festival, based around the “science” theme. In previous years, my team has been tasked with adapting the fairy tale of Prunella, adapting a post-apocalyptic short film script, and using two pictures given to us as the opening and closing frames of our film. Also, the festival makes participants select additional criteria from a hat, which can be anything from an added prop or action to having to shave 30 seconds off your end runtime. I’ve always been proud of the work we’ve produced and there is no better way to spend time with friends than collaborating on fun projects. We’ve been fortunate to have won best amateur film our first year of participating, as well as placing as finalists in our other years. Those interested have up until the launch date to join the competition. You can always compete individually, but it is significantly easier if you have a group of friends to help you through the process. Every year, there is always a few people who do stop motion or animation projects on their own, which is an incredibly ambitious undertaking and always fun to see. The diversity of skill levels that the competition attracts is also a marvel, from elementary school kids to industry professionals. The public screening of the finished films takes place on October 11th, with the winners announced on the 12th. If you don’t want to participate, you must at least come out to see some amazing work from Maryland filmmakers!